Dunk spinach in a cold water bath and then spin dry. Store in a damp towel in a plastic bag for up to 1 week. 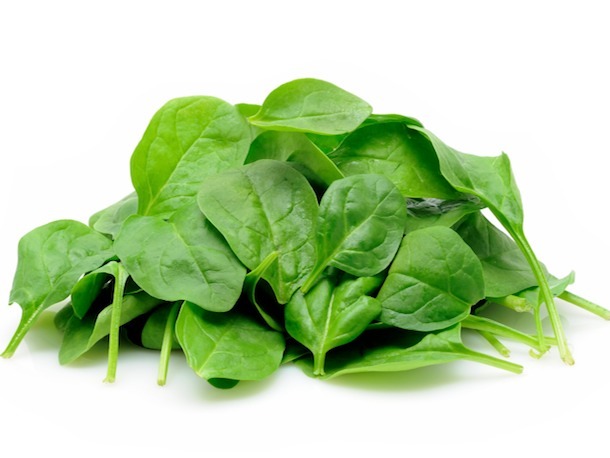 Spinach is a good source of Niacin and Zinc, and a very good source of Dietary Fiber, Protein, Vitamin A, Vitamin C, Vitamin E (Alpha Tocopherol), Vitamin K, Thiamin, Riboflavin, Vitamin B6, Folate, Calcium, Iron, Magnesium, Phosphorus, Potassium, Copper and Manganese. 2-3 lbs of spinach cooks down to 2 cups. Toss with olive oil, lemon juice, diced garlic, fresh basil leaves, and feta cheese for an easy fresh salad. Toss tender raw leaves into pasta.